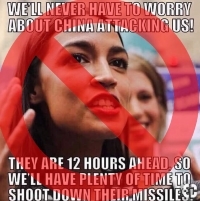 Q: Did Alexandria Ocasio-Cortez say “we’ll never have to worry about China attacking us” because of the country’s time difference? A: No. There is no evidence she made the statement used in a viral meme. 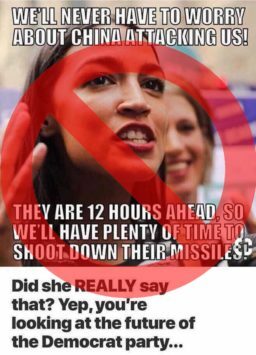 A meme that has gained momentum through thousands of shares on Facebook uses a false quote to take aim at Alexandria Ocasio-Cortez. The Democratic nominee for New York’s 14th Congressional District seat, who gained prominence after her primary victory over a 10-term incumbent, never made that illogical comment. While Ocasio-Cortez has been criticized for some remarks relating to foreign policy, we could find no evidence of her making any comments similar to the alleged quote. Instead, we found that the meme in question gained popularity when it was posted Sept. 4 on the Facebook page of America’s Last Line of Defense. That online publication uses numerous websites and its Facebook page to publish content that it deems satire, but that is routinely mistaken for valid news. The meme was also published by others across social media in recent weeks, including on the Facebook page of James Harris, a conservative radio host with hundreds of thousands of followers on the platform. Some users interacted with the post as if the quote was real, leaving comments questioning her intelligence. “How did she get out of the 6th grade?” one person asked. Others suspected it couldn’t be real and asked for proof of its veracity. “I love ya–but can you please give a source? I can’t find one, & I won’t share until I verify it,” another user wrote. Many others did not wait for verification. Almost 30,000 Facebook users shared the meme. “About.” Trumpbetrayed.us. Accessed 24 Sep 2018. Trent, Corbin, spokesman for Alexandria Ocasio-Cortez 2018 campaign. Phone interview with FactCheck.org. 24 Sep 2018. The post Viral Meme Makes Up Ocasio-Cortez Quote appeared first on FactCheck.org.